Ask anyone that knows me and they’ll tell you that I laugh like a maniac at any type of historical joke. Even as I write this I’m watching Season Two of Hercules. 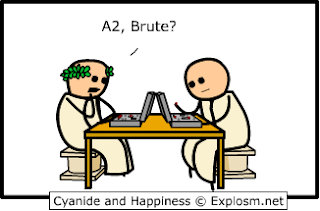 I just wanted to share one of my favourites, as I get ready to write cheesy puns for my fourth year classics class presentation. They a playing battleships. The one with the laurel leaves is supposed to be Caesar Augustus who was assasinated by a group that included his close friend Brutus. Actually, just to clarify, it’s Julius Caesar who was assassinated by Brutus, not Caesar Augustus.